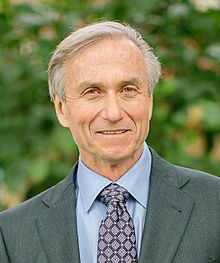 John A. McDougall (born May 17, 1947) is an American physician and author, advocate of a low-fat, whole food, vegan diet as preventing degenerative diseases. What they're trying to do in medicine today is find a pill to cover up every symptom of wrongful living and eating. So, to eat the normal American diet, what you have to do is take an antacid, a laxative, and then something to lower the uric acid, the cholesterol, the blood sugar, and the blood pressure. Then you have to take a diet pill because of the excess weight you gain because your normal appetite is confronted with calorie-concentrated foods. And then you have to go and wash the grease off your skin. Of course, it doesn't even begin to compensate for what you're doing to your body, but that's the way we look at the problem. Instead of dealing with the cause and supporting the body the way it's supposed to be supported, we try to cover up disasters. Quoted in “John McDougall” by Andis Robeznieks, in Vegetarian Times (April 1986), p. 31. It is no coincidence that the same diet that helps prevent or cure diabetes also causes effortless weight loss, lowers cholesterol and triglycerides, cleans out the arteries, and returns the body to excellent function. But no matter how much research appears saying the same thing over and over again, the tide is unlikely to change because of the economic incentives for the medical establishment of continued illness and profitable treatments. “Diet and Diabetes: The Meat of the Matter,” in EarthSave Magazine (November 2002), p. 22; as quoted in Will Tuttle, The World Peace Diet (Lantern Books, 2005), p. 85. The pain and suffering inflicted on children by the American diet is so brutal that if it were administered with a stick, parents would be put in jail. “Vegan Diet Damages Baby's Brain—Sensationalism!,” in VegNews (March–April 2003), p. 10; as quoted in Will Tuttle, The World Peace Diet (Lantern Books, 2005), p. 66. The food you put into your body is the single most powerful factor that determines your health and well-being. … I was transformed from a chronically ill young man to a person who could be considered the picture of health. At fifty-nine years of age (I was born in 1947), I continue to reap the benefits of fueling my body with the right foods. How many grandpas do you know who regularly windsurf in the deep blue ocean or strap their grandson into a backpack to carry him on a mountainous hiking adventure? Because of proper diet, this is the kind of health I enjoy today. Digestive Tune-Up (Healthy Living Publications, 2006), Introduction, pp. x-xi. Diet and nutrition advice is often focused on how much we ought to eat, and misses the point: More important than how much, how often, and when we eat is what we eat. Different kinds of animals require different types of diets. We humans are built to thrive on starch. The more rice, corn, potatoes, sweet potatoes, and beans we eat, the trimmer, more energetic, and healthier we become. Starch? Really? Isn't that for laundry? Yes, but it's also the key to optimum health and satiety. We hear a lot about carbohydrates and whether or not we should eat them, but we don't hear enough about the most valuable type of carbohydrate, starch. The Starch Solution (Rodale Books, 2013), Ch. 1, p. 6. Vegans are duly rewarded for their deep sacrifice when they discover that, in fact, plants provide all of the protein, amino acids, essential fats, vitamins, and minerals they need, and that eliminating meat and dairy from their diet provides a great many health benefits. Turning away from the fatty, empty calories in harmful, processed soy foods and vegetable oils allows vegans to truly shine, inspiring a change in their public perception from being marginalized to being admired for being healthy, trim, active, strong, energetic, and committed to changing the world. Isn't it fortunate that the same choices that best serve the planet and its inhabitants also benefit our personal health? The Starch Solution (Rodale Books, 2013), Ch. 10, p. 146.